Welcome to this, my first ever blog post as part of the Tattered Lace Blog Hop - please do tell me what you think of it, either by commenting at the bottom of this page or posting on my Facebook page. Don't be shy now! 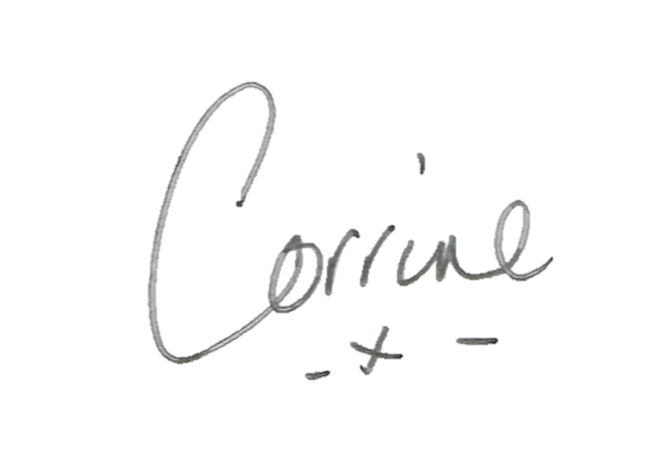 I really hope you enjoy reading about our favourite products. Who knows, we might be able to make this a regular feature - that would be great, especially if we can give away a prize each month! 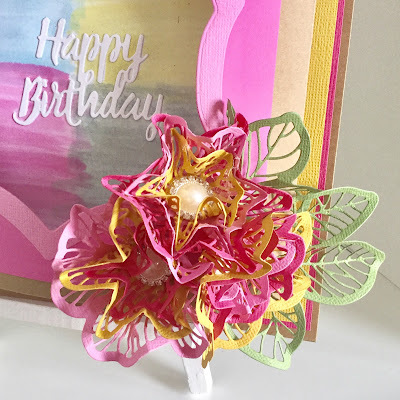 I decided to make my Blog Hop debut by showing you a card I made with the Desert Rose die set which can be purchased from www.crafting.co.uk. 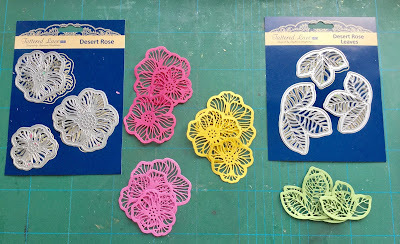 I used the Desert rose, Desert Rose leaves and Desert Rose Doily Nested set. Here's a picture of the finished card. As you can see, I opted to keep the colours simple and I decided to use block colours. Step 1. The first thing I did was to create a colour wash background using distress inks - which for no particular reason seems to be my favourite thing to do at the moment! I picked Broken China, Picked Raspberry, Mustard Seed and Bundled Sage. 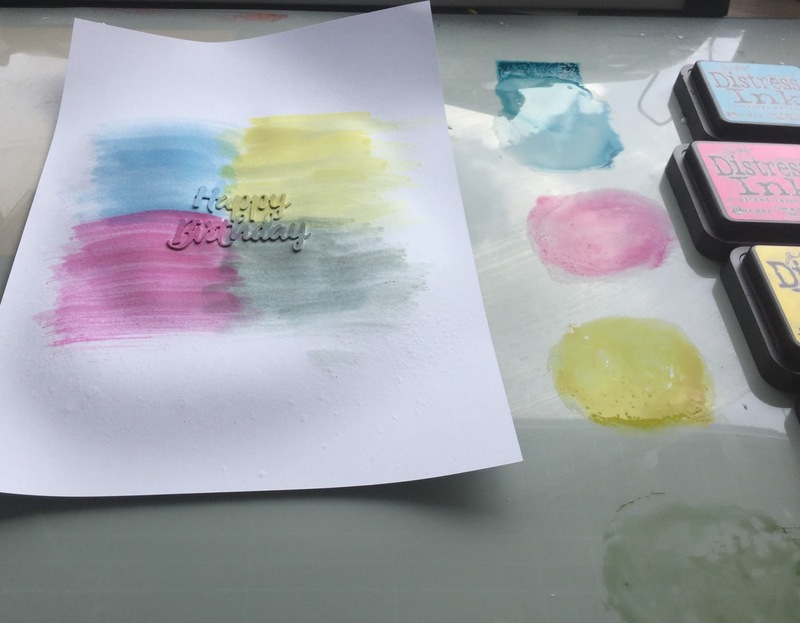 After wetting the card I brushed them across it using my fabulous Rare Earth Brushes. Step 2. 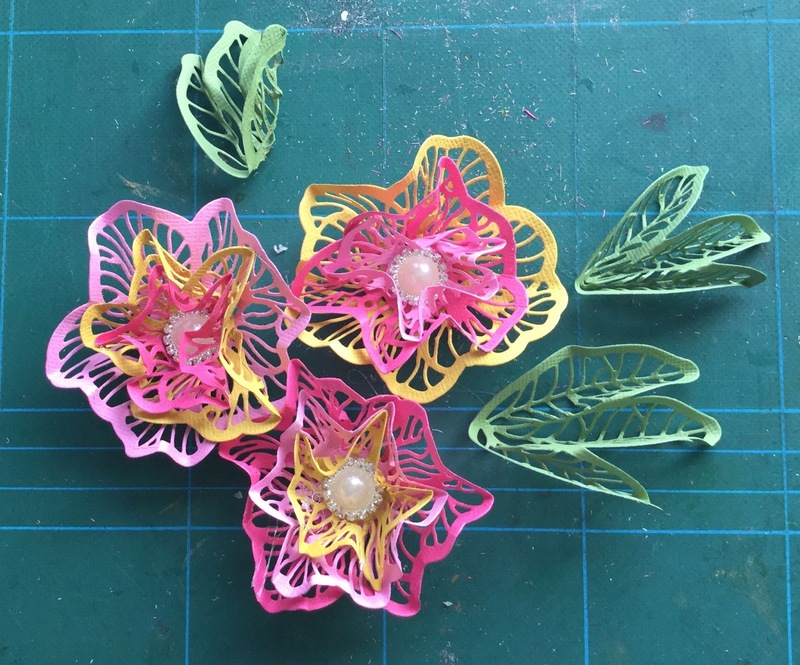 While the background was drying (and if you're as impatient as I am, you can use your heat tool to hurry up this process) I cut out three sets of the Desert rose flower and one set of the leaves. Step 3. I folded up the die cuts to give them shape and dimension and then stuck the flowers together in alternate colours with a beautiful 'blingy' embellishment in the centre of each flower. I find these embellishments draw the eye in and really work well in tying everything together. The card base measures 20 x 20 cm and the mat layers are 19.5 x 19.5 cm (deep pink) and 19 x 19 cm for the yellow layer. I made the card front from a piece of craft card (to match the base) that I had cut to 17 x 23 cm. I scored this at 2 and 21 cm as you can see in the picture below on the right. The aperture is created from the largest nested doily. The final panel is 16 x 16 cm and the frame is made using the first and third largest nested doily dies. Step 5. Finally it was just a case of assembling all the component parts, arranging and sticking the flowers on the front, adding a pretty complementary bow and the die cut sentiment before putting the kettle on and getting out the biscuit tin. 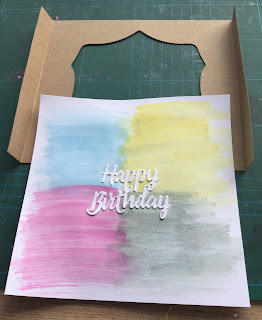 So now please pop along to Hels Sheridan's blog - no need to rush, there's plenty of room for everyone - and see what beautiful product she is showcasing. But perhaps most importantly of all, DO NOT FORGET to go back to the original post on the Tattered Lace Facebook page to answer the questions for your opportunity to be in with a chance to win the fantastic prize on offer. Good luck and fingers crossed for you! 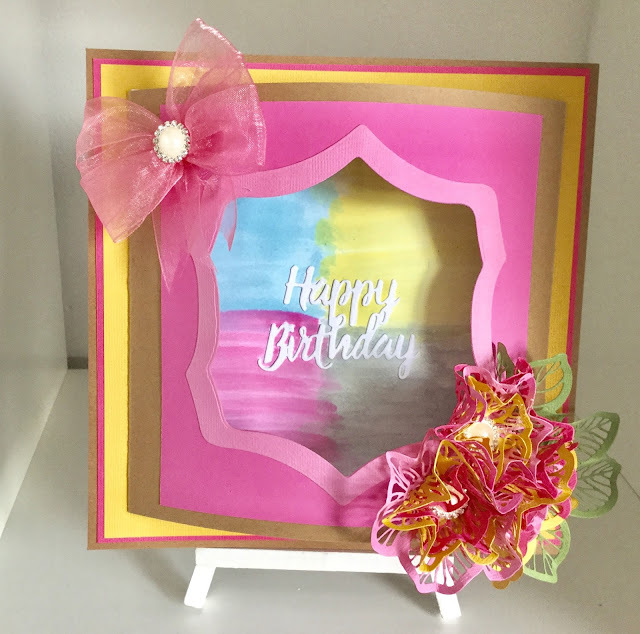 Love the color wash background you created and such beautiful flowers!! I have some tattered lace dies and love them!! I can't imagine what it must be like to live in a desert - it must be fantastic Linda! SO sweet! I LOVE those lacy flowers!! Thank you. They are very pretty and i think the colours really make them pop! Adorable card. I like how you did the background and the TL dies you used. Tfs. Love the dimension and bright colors! So pretty! Awesome TL dies!